Growing up in an Asian household in Australia, Tim Tams were one of my favourite snacks; while asian flavours such as matcha and red bean were prominent in my most loved desserts. Therefore, I couldn’t resist combining two slices of my childhood to create these matcha and red bean Tim Tams. The cookies having a strong matcha taste, but is mellowed out with the sweet buttercream and chocolate coating. Be warned - these are incredibly moreish and a matcha made in heaven! 1. To make Matcha Cookies: Sift flour and matcha powder in a bowl and set aside. Beat butter and sugar in a stand mixer until light and fluffy. Add in egg and vanilla until just combined. 2. Gradually add in the sifted dry ingredients, and mix on low speed until incorporated. Divide into two discs and wrap in cling wrap. Chill in refrigerator for at least 30 minutes. 3. When dough is ready to be rolled, preheat oven to 180˚C. Roll out dough between 2 pieces of parchment paper, to no more than 1/2cm in thickness. Using a knife or pizza cutter, cut into rectangles roughly 3cm x 5cm in size. Chill in freezer for 10 minutes, then bake for 12-14 minutes; or when edges being to brown. Cool completely on a wire rack before decorating. 4. To make Red Bean Buttercream: Mix together butter, icing sugar and red bean paste until creamy and combined. Transfer into a piping bag and cut the tip off. 5. To assemble: Pipe buttercream on half of the matcha cookies, then sandwich the other half on top. Place in freezer for at least 10 minutes to chill. 6. While the cookies are chilling, melt white chocolate over a double boiler. Add in sifted matcha powder, then coconut oil to thin out the chocolate. Dip the chilled cookies into the chocolate with a fork, and tap off the excess chocolate. Place on lined baking tray to set. Before chilling the cookie sandwiches, stick pumpkin seeds into the buttercream for the cat ears. Chill and dip as above, then after the chocolate has set - dip small sections of the Tim Tam into white chocolate. Lastly, pipe on final details with black royal icing. If you give these a go, be sure to tell me what ya think! 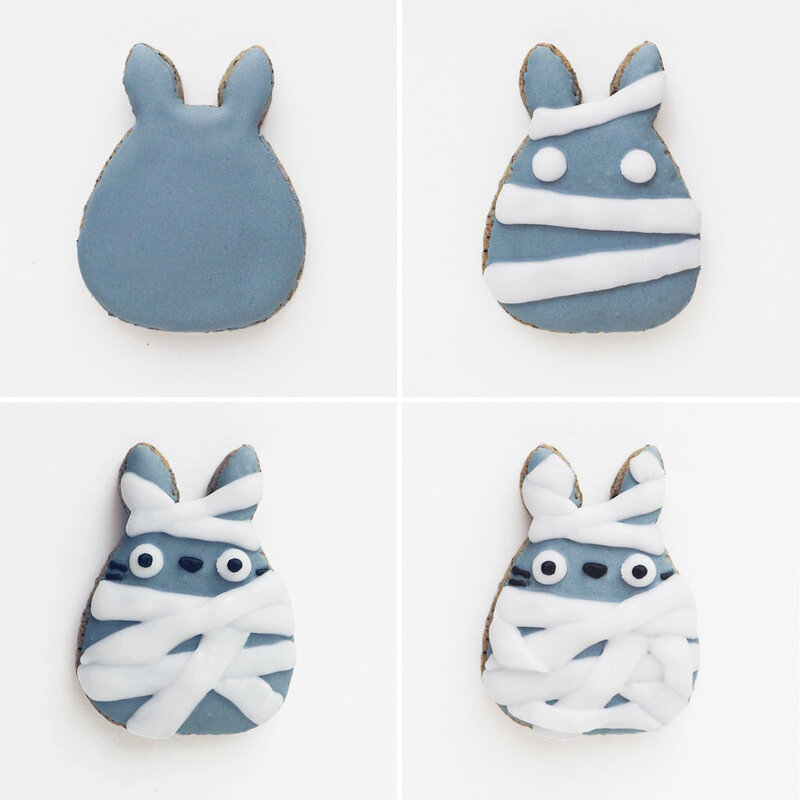 Kicking off Totoro Week with a little Halloween inspiration! I've always loved black sesame in sweets, and these cookies are no exception. And yes - Totoro Week is a thing. 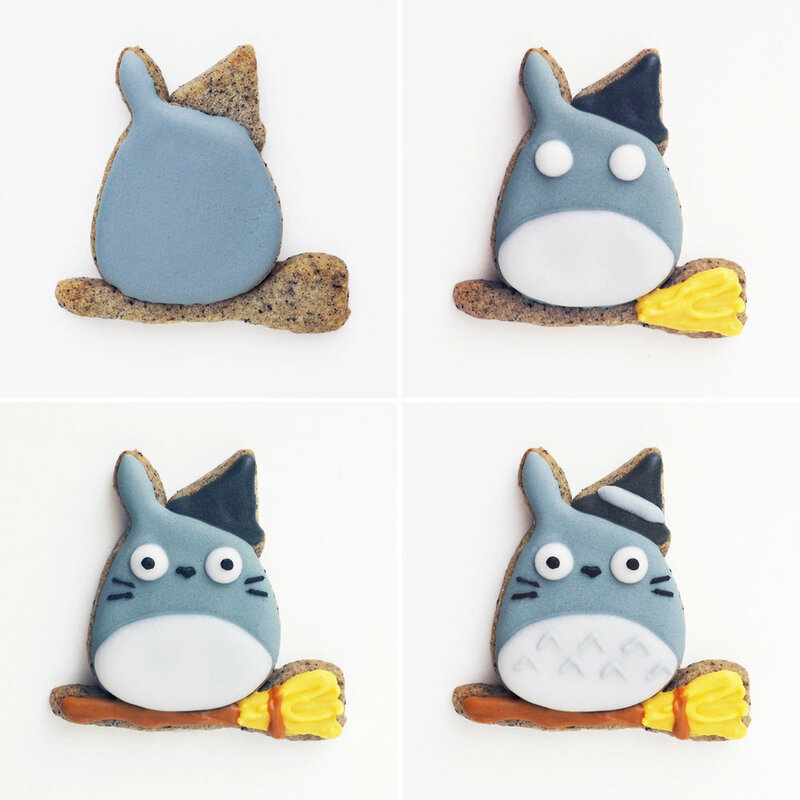 My creative Insta pals Steph (I Am a Food Blog) and Lyndsay (Coco Cake Land) dreamed up this totoro-lly awesome week, which occurs on the last week of October. Join in on the fun with the hashtag #TotoroWeek on Instagram. 1. Cream butter and sugar until light and fluffy. Add in egg and vanilla until incorporated, then gradually add in sifted flour and black sesame powder mixing on low speed until just combined. Shape into 2 discs, wrap in cling wrap and refrigerate for at least 30 minutes. 2. When dough has chilled, pre-heat oven to 175˚C. Roll out dough between two pieces of parchment paper, and cut out using a Totoro shaped cookie cutter. Transfer onto a lined baking tray, and place in freezer for 10 minutes before baking. 3. Bake for 10-12 minutes, or when edges begin to slightly brown. Cool completely before decorating. 4. While the cookies are cooling, dye the icing with gel based food colouring. Some of the colours will need to be thicker consistency than others. Below is a guide. Flooding consistency icing: grey, white, orange, green. Stiff consistency icing: black, orange, yellow, brown. 5. Decorate! See below for the step-by-step for each design. Note: If you don't like your cookies too sweet, you can skip the step of the grey icing base, and also use matcha cookies as the base for Frankenstein Totoro. 1. Pipe the top half of the cookie with grey icing. Dry for 30 minutes. *NOTE: For the pumpkin 'hat', shape dough into a small ball and stick to cookie before baking. 2. Add pumpkin base with orange icing, and white base for the eyes. 3. Using a thicker consistency orange icing, add on the pumpkin details. Pipe on facial features with black icing. 4. Add a little brown stalk onto the pumpkin hat, and a face to the pumpkin. 1. Pipe the Totoro base with grey icing. Dry for 30 minutes. *NOTE: For witch hat, use a small triangle cookie cutter to cut out the hat, then stick to the cookie before baking. 2. Add the hat, eyes and belly. Pipe on the top of the broom with thick consistency icing for the texture of straw. 3. Add on broom stick and facial details. 4. Pipe the triangles on Totoro's belly, and the strip on the hat. 1. Pipe the base of the cookie with green icing. Dry for 30 minutes. 2. Add white base for the eyes and belly. Wait for outer layer of icing to dry. 3. Pipe triangles on the belly, and facial details. 4. Add small scar marks with black royal icing. 1. Pipe the base of the cookie with grey icing. Dry for 30 minutes. 2. Add white base for the eyes, and a few white strips. 3. Pipe on the facial details with black icing, and add extra white strips of icing. 4. Add final touches of strips, some layering over the previous ones. Lyndsay made this adorable Matcha Frankenstein Totoro Cake! Definitely a matcha made in heaven! Em made Tamagoyaki Totoros in a rice cooker! Um what? Tamagoyaki is one of my all time favs, so I will definitely be trying these out. 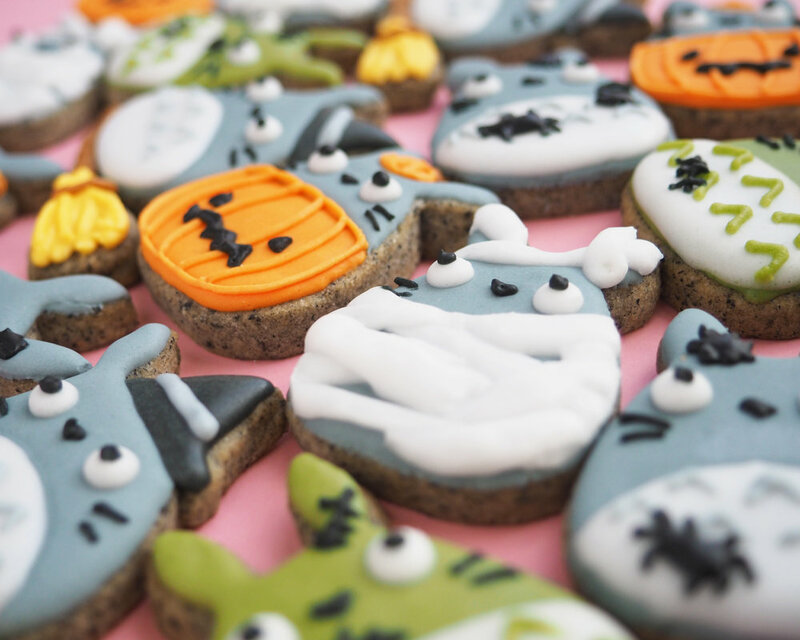 Syl's divine Totoro rice krispie treats have me salivating (though I don't know if I could bear to eat these cuties)! 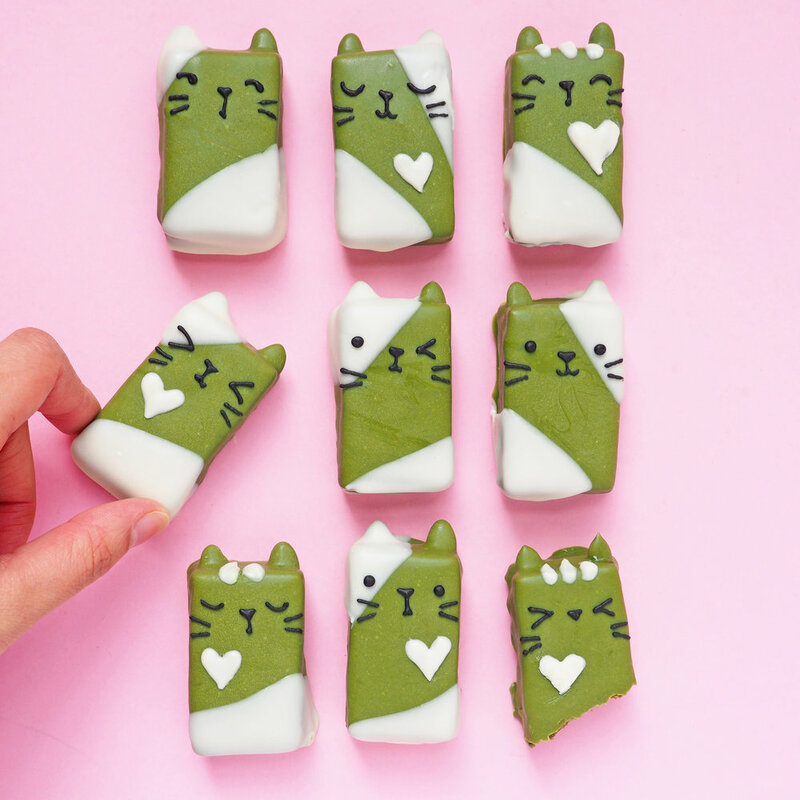 Oh my ghourd, how magic are these Totoro Pumpkin Cheesecake Bars? Soot Sprite Chocolate Sparkle Cookies - These sweet little morsels are just too sweet. Steph, you smart cookie! 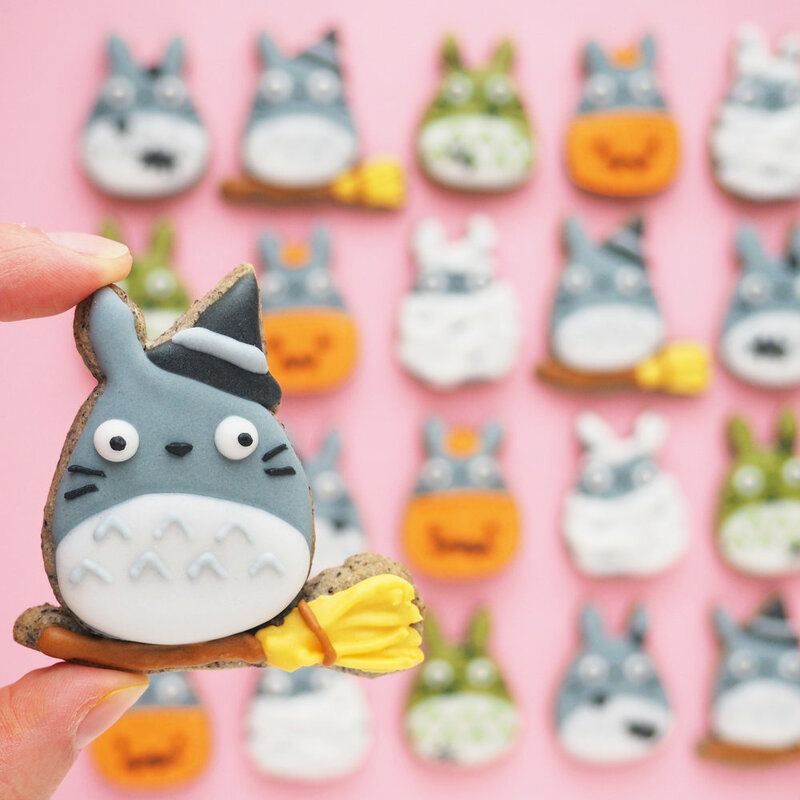 If you make anything Totoro related, or try out any of our recipes, don't forget to use the hashtag #TotoroWeek to show us your creations! "Life is a journey to be experienced, not a problem to be solved." Winnie the Pooh was a large part of my childhood, and as much as I loved it back then, a new found appreciation for the characters and stories grew as I got older. For me, revisiting childhood favourites is always an eye-opening experience, whether it is discovering new lessons on life and friendship, or finding traits of yourself in some of your favourite characters. 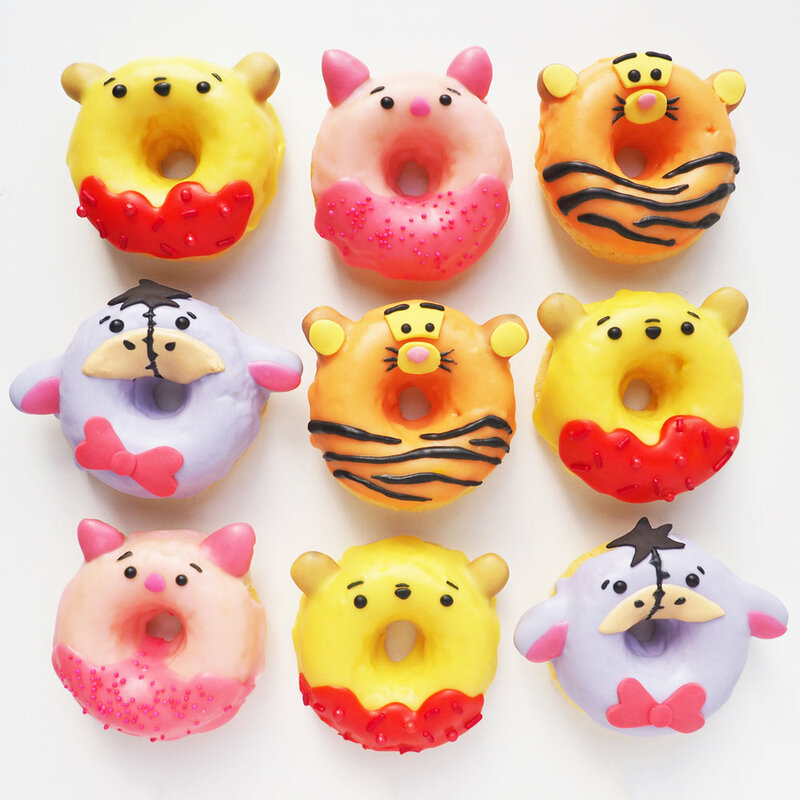 Taking inspiration from the adorable Disney Tsum Tsum range, I created some unbearably cute baked cake donuts in reminiscence of those times. 1. To make the donuts: Pre-heat oven to 175ºC fan forced. Sift the flour and set aside. 2. Whisk the egg, yoghurt, milk and vanilla in a bowl and set aside. Beat the butter and sugar in a stand mixer until light and fluffy, then add lemon rind. On low speed, gradually add in the wet ingredients and the flour, alternating each time. 3. Grease donut pans with non stick spray or oil. Transfer batter into piping bag and cut the tip off. Fill donut pans 2/3 of the way full, and bake for 10-12 minutes. Transfer onto wire rack and cool completely before decorating. 4. To make the Icing: Combine sifted icing sugar, milk and lemon juice in a bowl, and whisk until smooth. Using gel food colouring, dye icing into yellow, orange, baby pink and purple. These colours will be the base coat of the donuts. With the leftover icing, create small portions of hot pink, red and beige for the extra detailing; then place them in piping bags. 1. Dip the pointy end of the almonds in melted chocolate, then stick into the donuts for the ears. 2. When the chocolate has dried, dip into the yellow icing, shaking off any excess. Leave on wire rack to set. 3. Pipe on a dripping effect with red icing on the bottom section of the donut. Add sprinkles if desired. 4. Add on eye and nose details with royal icing. 2. When the chocolate has dried, dip into the orange icing. 3. Roll out yellow fondant, and cut out shapes for the eyes, ears, and nose areas. You can use a thick straw, small fondant cutters, or cut them freehand. Stick them onto the donut. 4. Pipe on eyes, nose, whiskers and stripes with royal icing. 1. Dip the wide end of the almonds in melted chocolate, then stick into the donuts for the ears. 2. When the chocolate has dried, dip into baby pink icing and leave on wire rack to set. 3. Pipe on ears, nose, and the dripping effect onto the donut with hot pink icing. Add sprinkles if desired. 4. Pipe on eyes and eyebrows with black royal icing. 1. Dip the pointy corner of the almonds in melted chocolate, then stick into the donuts for the ears. 2. When the chocolate has dried, dip into the purple icing, and leave on wire rack to set. 3. Pipe on ear details with hot pink icing, and beige for the nose section. Cut out the hair details with black fondant, then stick onto the top of the donut. 4. Roll out hot pink fondant, and using a small heart shapes cutter and a small straw, make a bow and place onto the bottom half of the donut. Add on the stitching, eye and nose details with black royal icing. Which Winnie the Pooh character would you be? Let me know in the comments below! Stir in 1 mashed banana + 1 large spoonful of peanut butter into the original pancake batter. If you’re a huge peanut butter fan, don’t hesitate to add more! When cooked, top with peanuts, fresh bananas, blueberries and a generous serving of maple syrup. Use bananas secured with toothpicks for the ears, and pre-prepared fondant for the details. Dice a handful of strawberries and mix them into the buttermilk pancake batter. For the ombré effect, add a bit of pink food dye every few pancakes made. Serve with cream, strawberries, blueberries and a touch of magic! Add sprinkles and flowers for extra garnishing. The horns, ears and eyes were made with fondant the day before, painted with a combination of edible gold luster dust and an alcohol based liquid. To create thicker pancakes which are more consistent, I used large metal circle cookie cutters as a mould. Make sure the heat isn't on too high, otherwise you might get some burnt pancakes! How would you customise your pancakes? Fresh fruit is always a go-to for me! The first time I made these honeycomb shortbread cookies was over 2 years ago, not long after I began documenting my baking journey on Instagram. Despite the simplicity, these melt-in-your-mouth cookies are still one of my favourite creations to date, which is why I want to share the recipe with you all! For someone who usually isn’t a fan of honey, let me assure you - these are worth the buzz. 1. To make cookies: Beat butter and sugar with an electric mixer until light and fluffy, then add honey until just combined. Gradually add in flour and beat on low until dough forms and pulls away from the side of the bowl. Form dough into a disc, and wrap in cling wrap. Refrigerate for at least one hour. 2. When the dough has chilled, preheat oven to 175ºC and line baking trays with parchment paper. Lightly sprinkle clean surface with flour, and roll out cookie dough to approximately 3/4cm in thickness. Using a small hexagon cookie cutter, cut dough to resemble honeycomb. Place in freezer to chill for 10 minutes before baking. Optional: You can also cut out mini bee cookies for decoration. Alternatively, store bought or homemade royal icing bees work just as well. 3. Bake for 12-15 minutes, or when edges begin to brown. This will be dependant on size and thickness of cookies, so keep an eye out! Leave them on the tray until warm to touch, then transfer to a wire rack to cool completely before decorating. 4. To decorate: While the cookies are cooling, start on the royal icing. Mix the meringue powder and hot water in a large bowl on low speed until the powder has dissolved. Gradually add the icing sugar, and mix on low until combined; then add the flavouring. Beat on medium speed for around 5 minutes, or when the icing is thick and extremely white in colour. 5. Divide the royal icing into 3 bowls, and dye them 3 different shades of yellow. You may need to add more water for a thinner consistency. Have a look at this guide by Sweet Sugar Belle for more information on icing consistency. Transfer icing into piping bags, then carefully outline and flood the cookies one at a time. Use a toothpick to pop any air bubbles or smooth out icing if necessary. Enjoy them as they are, or leave them out to dry overnight for the royal icing to completely set!